Just when you start to forget it this team has a tendency to remind you that, at times, they really can play good basketball. Michigan handled Minnesota on the Gophers’ home floor in one of their best performances of the year. Minnesota has been struggling almost as much as the Wolverines over the last couple weeks but I’m still surprised that Michigan could put together this impressive of a performance. Michigan has been through some brutal losses over the last couple weeks; everything from late game collapses and missed buzzer beaters to blowouts. 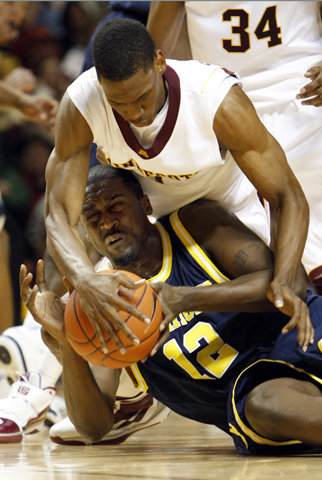 Playing for little more than pride and an NIT berth, Michigan responded. Michigan must have had a good week in practice because they looked as well prepared as they have in a while. They executed their game plan to a T and played inspired basketball on both ends of the court. In short, they played the way they are capable of playing. Michigan shot the ball extremely well, especially in the second half (68%). Their 56.7/50/50 (eFG/2pt/3pt) shooting line was one of the best they have had in quite some time. For the second game in a row, Michigan didn’t focus their attack on the three point shot, shooting only 14 of 52 field goal attempts from three point range. Instead they focused their interior attack on the two man game between Sims and Harris; six of Harris’ seven assists were to DeShawn Sims. Another sign that Michigan was playing crisp offense is that 20 of their 26 made field goals came off of assists. The biggest difference in this one was that Michigan won the turnover battle in a landslide. Michigan turned the ball over on only 13.6% of their possessions while Minnesota coughed it up on 25.4% of theirs. Minnesota’s pressure defense forces a 25% turnover percentage on the year so Michigan deserves credit for holding onto the ball. Defensively, Michigan looked very good despite allowing Minnesota to shoot a very respectable 52.4/48.1/41.2. Minnesota was also able to get to the line, especially in the second half. Their free throw rate (FTA/FGA) for the game was 52.3% and it was an astounding 160% in the second half. Despite shooting well, Minnesota only scored 1.06 points per trip compared to Michigan’s 1.20 PPP (second best all year). Despite Associated Press reports to the contrary, Michigan ran very little 1-3-1 zone. I actually can’t recall Michigan using the zone until the very last possession or two of the game. Bobby Knight also managed to mention Michigan’s affinity for the 1-3-1 zone countless times during a game where Michigan ran “100% man-to-man”. At this point I’m convinced that Michigan could not run the 1-3-1 zone all year and they would still be considered a “zone” team. It was a good win for Michigan especially after the last couple weeks of frustrating and even embarrassing losses. But let’s not make Minnesota out to be something they’re not. Minnesota has lost five of seven games and beat writer Myron Medcalf penned a blog entry after the game about Minnesota’s lack of desperation that’s eerily similar to things that have been said about Michigan over the course of this trying season. Michigan gets a little more time off before trying to make it two in a row with a road game at Iowa next Tuesday. DeShawn Sims: Sims started the game slowly, he was benched early and was only 2 of 6 from the field with 2 turnovers. In the second half he was dominant: 10 of 12 for 21 points. When things are going well for Sims he is almost unstoppable, however most of his offensive play in Minneapolis was thanks to Manny Harris who found him time and again. Manny Harris: Manny Harris found his offensive game tonight. He didn’t shoot the ball exceptionally well (5-14) but he played a tremendous all around offensive game. He consistently managed to drive the lane and either got to the free throw line or found DeShawn Sims for an easy basket. Manny’s defense still leaves a lot to be desired. He lost his man (especially Hoffarber) several times when he was caught ball-watching and he actually go pulled for i early in the second half. Darius Morris: It appears that the kid might have finally found his stride: 5 points, 5 assists, 2 turnovers, 3 rebounds. Darius played by far his best game of the season. He controlled the offense, hit shots when he needed to, and made a few highlight dishes. Morris needs 30 minutes and the ball in his hands every night from here on out. Stu Douglass: Douglass didn’t shoot the ball well but he had 5 steals, 4 assists, 2 rebounds, no turnovers, and one of the prettiest backdoor cuts of the entire season. Zack Novak: Nothing particularly exceptional from Novak but he really has to find a way to stay out of foul trouble. Zack Gibson: 8 points in 9 minutes for the big fella on 3 of 3 (2-2 3pt) shooting. It is a huge boost when Michigan can get that kind of a boost out of Gibson. In total Michigan got 35 points out of the five position. Anthony Wright: When you are a backup, it’s probably a good sign when there isn’t much to say about your play. Wright was forced to play a little extra because Novak was in foul trouble and he didn’t stand out and even picked up two assists. Laval Lucas-Perry: Laval just isn’t competent enough with the ball in his hands to even see the floor against a team like Minnesota. I would be surprised to see Laval get many minutes down the stretch.